Southern Dispersal Route: When Did Early Modern Humans Leave Africa? The Southern Dispersal Route refers to a theory that an early group of modern human beings left Africa between 130,000–70,000 years ago. They moved eastward, following the coastlines of Africa, Arabia, and India, arriving in Australia and Melanesia at least as early as 45,000 years ago. It is one of what appears now to have been multiple migration paths that our ancestors took as they left out of Africa. Modern Homo sapiens, known as Early Modern Humans, evolved in East Africa between 200,000–100,000 years ago, and spread throughout the continent. The main southern dispersal hypothesis starts 130,000–70,000 years ago in South Africa, when and where modern Homo sapiens lived a generalized subsistence strategy based on hunting and gathering coastal resources like shellfish, fish, and sea lions, and terrestrial resources such as rodents, bovids, and antelope. These behaviors are recorded at archaeological sites known as Howiesons Poort/Still Bay. The theory suggests some people left South Africa and followed the eastern coast up to the Arabian peninsula and then traveled along the coasts of India and Indochina, arriving in Australia by 40,000–50,000 years ago. The notion that humans might have used coastal areas as pathways of migration was first developed by American geographer Carl Sauer in the 1960's. Coastal movement is part of other migration theories including the original out of Africa theory and the Pacific coastal migration corridor thought to have been used to colonize the Americas at least 15,000 years ago. Archaeological and fossil evidence supporting the Southern Dispersal Route includes similarities in stone tools and symbolic behaviors at several archaeological sites throughout the world. The site of Jwalapuram in India is key to dating the southern dispersal hypothesis. This site has stone tools which are similar to Middle Stone Age South African assemblages, and they occur both before and after the eruption of the Toba volcano in Sumatra, which has recently been securely dated to 74,000 years ago. The power of the massive volcanic eruption was largely considered to have created a wide swath of ecological disaster, but because of the findings at Jwalapuram, the level of devastation has recently come under debate. There were several other species of humans sharing planet earth at the same time as the migrations out of Africa: Neanderthals, Homo erectus, Denisovans, Flores, and Homo heidelbergensis). The amount of interaction Homo sapiens had with them during their sojourn out of Africa, including what role the EMH had with the other hominins disappearing from the planet, is still widely debated. Stone tool assemblages in Middle Paleolithic East Africa were primarily made using a Levallois reduction method, and include retouched forms such as projectile points. These types of tools were developed during Marine Isotope Stage (MIS) 8, about 301,000-240,000 years ago. People leaving Africa took those tools with them as they spread eastward, arriving in Arabia by MIS 6–5e (190,000–130,000 years ago), India by MIS 5 (120,000–74,000), and in southeast Asia by MIS 4 (74,000 years ago). 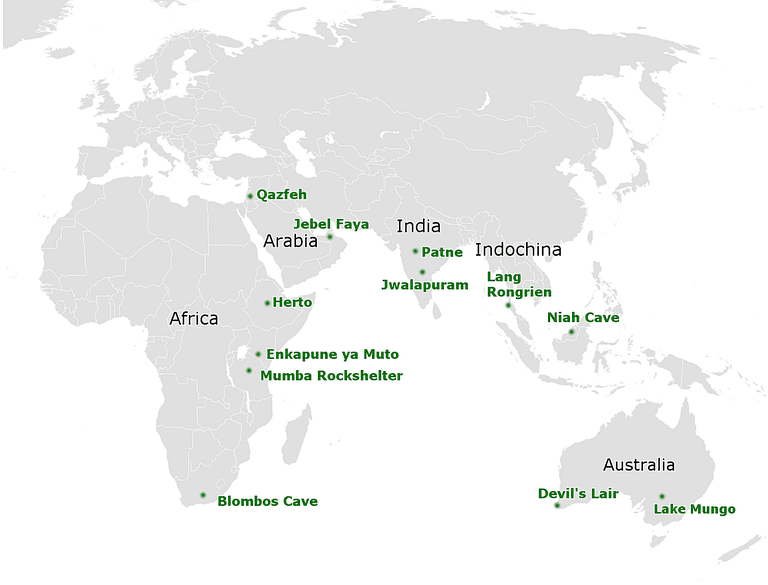 Conservative dates in southeast Asia include those at Niah Cave in Borneo at 46,000 and in Australia by 50,000–60,000. The earliest evidence for symbolic behavior on our planet is in South Africa, in the form of the use of red ochre as paint, carved and etched bone and ochre nodules, and beads made from deliberately perforated sea shells. Similar symbolic behaviors have been found at the sites which make up the southern diaspora: red ochre use and ritual burials at Jwalapuram, ostrich shell beads in southern Asia, and widespread perforated shells and shell beads, hematite with ground facets, and ostrich shell beads. There is also evidence for the long distance movement of ochres—ochre was so important a resource it was sought and curated—as well as engraved figurative and non-figurative art, and composite and complex tools such as stone axes with narrow waists and ground edges, and adzes made of marine shell. So, in summary, there is growing evidence that people began to leave Africa beginning at least as early as the Middle Pleistocene (130,000), during a period when the climate was warming. In evolution, the region with the most diverse gene pool for a given organism is recognized as a marker of its point of origin. An observed pattern of decreasing genetic variability and skeletal form for humans has been mapped with distance from sub-Saharan Africa. At the moment, the pattern of ancient skeletal evidence and modern human genetics scattered throughout the world best matches a multiple-event diversity. It seems that the first time we left Africa was from South Africa at least 50,000–130,000 then along and through the Arabian peninsula; and then there was a second outflow from East Africa through the Levant at 50,000 and then into northern Eurasia. If the Southern Dispersal Hypothesis continues to stand up in the face of more data, the dates are likely to deepen: there is evidence for early modern humans in southern China by 120,000–80,000 bp. Armitage, Simon J., et al. "The Southern Route "out of Africa": Evidence for an Early Expansion of Modern Humans into Arabia." Science 331.6016 (2011): 453–56. Print. Boivin, Nicole, et al. "Human Dispersal across Diverse Environments of Asia During the Upper Pleistocene." Quaternary International 300 (2013): 32–47. Print. Erlandson, Jon M., and Todd J. Braje. "Coasting out of Africa: The Potential of Mangrove Forests and Marine Habitats to Facilitate Human Coastal Expansion Via the Southern Dispersal Route." Quaternary International 382 (2015): 31–41. Print. Ghirotto, Silvia, Luca Penso-Dolfin, and Guido Barbujani. "Genomic Evidence for an African Expansion of Anatomically Modern Humans by a Southern Route." Human Biology 83.4 (2011): 477–89. Print. Groucutt, Huw S., et al. "Stone Tool Assemblages and Models for the Dispersal of Homo Sapiens out of Africa." Quaternary International 382 (2015): 8–30. Print. Liu, Wu, et al. "The Earliest Unequivocally Modern Humans in Southern China." Nature 526 (2015): 696. Print. Reyes-Centeno, Hugo, et al. "Genomic and Cranial Phenotype Data Support Multiple Modern Human Dispersals from Africa and a Southern Route into Asia." Proceedings of the National Academy of Sciences 111.20 (2014): 7248–53. Print. Reyes-Centeno, Hugo, et al. "Testing Modern Human out-of-Africa Dispersal Models Using Dental Nonmetric Data." Current Anthropology 58.S17 (2017): S406–S17. Print. What Occurred During the Middle Paleolithic Period? Why Don't Archaeologists Use the Term 'Cro-Magnon' Anymore? What Did Australia Look Like When the First People Arrived? What Is the Timeline of the Stone Age? How Long Did We Use Acheulean Handaxes? Does Science Know What (or Who) Killed the Planet's Big Mammals?